A Shandong 5000 electroglide flatbed currency printing machine named ‘Ted’ has edged ahead in a fiercely competitive fight for the chairmanship of the US Federal Reserve, narrowly in front of its major rival, the Heidelberger Druckmaschinen high speed sheet fed rotary offset press, christened ‘Heidi’. In an ominous sign for supporters of the Heidelberger Druckmaschinen candidacy, a number of US Senate Republicans are circulating a letter supporting the Shandong 5000 model in its quest to replace Janet Yellen at the head of the world’s most important central bank. The Shandong 5000 is a six colour high speed flexo letterpress printing machine which can churn out up to $200 trillion in high denomination bills in less than 60 seconds. In a subtle technical innovation, these bills can then be immediately declared illegal and holders of them instantaneously vaporized. The only other serious contender, a 70 ton Komori Super Orlof Intaglio based in Tokyo, melted after recent deployment by the Bank of Japan. Senate Democrats rounded on the nomination of a Chinese printing machine in what critics interpreted as a thinly veiled racial slur that ran the risk of igniting an international trade war. Supporters of the Shandong 5000 electroglide pointed out that the only domestic US manufacturer of high speed, sheet fed rotary 1-10 Intaglio currency printing machines filed for insolvency 60 years ago after using Alan Greenspan for consulting services. Some Wall Street analysts were skeptical that a flatbed currency printing machine was really the best fit for the task at hand. Marti Venal at SalesWeasel GoldFelon pointed out that in the 21st century, digital central bank reserves could be created effortlessly electronically without any resort to the printing press whatever. His colleague Dwight Craven added that three staffers at the Federal Reserve had recently been crushed to death by the accidental toppling of a two mile high mountain of hundred dollar bills following the January 14th 11:02 a.m. Part 57 iteration of the Fed’s latest 8,000-stage quantitative easing programme. “The Heidelberger Druckmaschinen boomlet is now looking like a Heidelberger Druckmaschinen backlash,” added Venal. Republicans seem more welcoming of the Shandong 5000 candidacy, despite some disagreements over the machine’s reliability. The Shandong 4000 series was prone to overheating, occasional power outages, and sometimes exploding spectacularly showering shards of molten steel at supersonic speed over its support workforce. This made the Shandong 4000 only slightly less dangerous than a full service investment bank. The Heidelberger printer has long been a bogeyman for some liberals. They regard the machine as a close colleague of former Treasury Secretary Robert Rubin whose backing for the financial sector and appetite for unrestrained deregulation has been widely blamed for the banking crisis. There has also been criticism as to the robustness of the Heidelberger currency printer in light of the near-constant requirement to print money 24/7, 365 days a year, and concern as to whether components of the printer have been ethically sourced. “It used to take 5,000 Chinese workers to make the cylinder of one of our machines,” said a company spokesman. 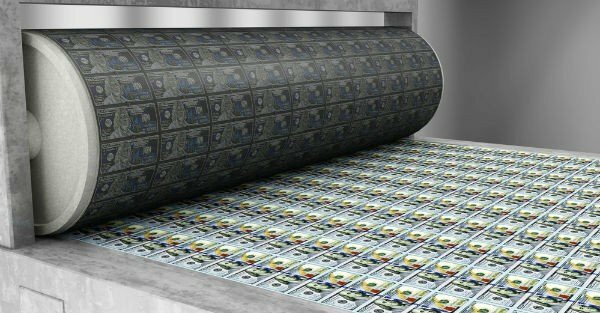 Over in Europe, monetary authorities have commissioned 14,000 Wolf-Krugman ultra-speed printing machines in order to prepare for March’s looming currency offensive. The Bank of England, meanwhile, is preparing to unveil its new currency bazooka, a QE-969 Howitzer railgun capable of shooting money at 5,800 MPH into the economy, rendering it instantly inert. In other news: The last remaining skeptic of the effectiveness of money printing was fired from the ECB. By a giant cannon. Into Switzerland.